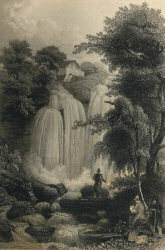 Image: Wasserfall bey Langenfeld anno 1840. 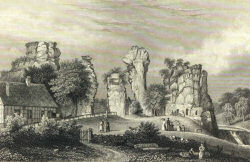 Engraving by A. H. Payne after a painting by C. Schlickum. Image: Die Externsteine anno 1840. Engraving by E. T. Brain after a painting by C. Schlickum. The Weserbergland is a typical German highland, which is located in southern Niedersachsen (Lower Saxony) and northern Hessen. It is named after the river Weser, which flows through this mountains in many meanders. Actually the region Weserbergland are the mountains along the river between Hannoversch-Münden and Minden. On this site we put more emphasis on the geologic situation than on geographic and politic boundaries. So the area we are talking about actually is a bit larger. This area is the most important karst area of both, Hessen and Niedersachsen. Limestones and dolomites from the Muschelkalk with sometimes heavy tectonic alterations. The layers are tilted, folded and sometimes turned upright. So the landscape shows escarpments and ridges. The area is fairly karstified, but the caves are rather small. Other karst features are much more important: karst springs, tufa deposits, dolines and waterless ridges.